We are a company working in the field of collecting and recycling electrical and electronic waste devises to supply dismantled components to different customers. Mother boards, Rams , Processors to extrude six kinds of precious metals like gold and titanium. Also Iron, copper, wires and aluminium to metals dealers. We use new ways of collecting e-waste which is the key this business. 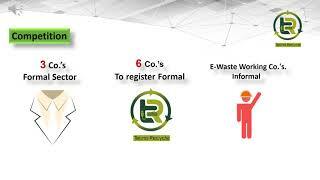 We established website to connect end user directly which faces problem in e-waste disposal so we can make collect schedule for end user and suppliers using website and Facebook. We have advantage on our work that we can find reusable components so we can assemble refurbished devises and selling it with respectively high price. E-waste business is promising business in Egypt and Africa.We have records that Egypt export 100000 ton e-waste yearly and it’s have of available quantity. I'm a mechanical Engineer started my career in heavy equipment service at international corporate. I got involved in solid waste recycling process and equipment until i finally established my own business in different waste recycling management. As i have my own experience in solid waste recycling i started to open business in electrical and electronic waste recycling in Egypt as its rich and promising business in middle east and Africa. I joined Sedari association training program sponsored by Switzerland and Egyptian governments to qualify startups companies to work in safe e-waste recycling as it have a lot of effects on environment. I made a qualified team and we have finished market research and technical knowledge to start our business. I Also have researches in waste management. I have filed a patent in 2014 and its taking considered course in approving stage which i believe it will serve developing countries to safe transfer and disposal of waste.